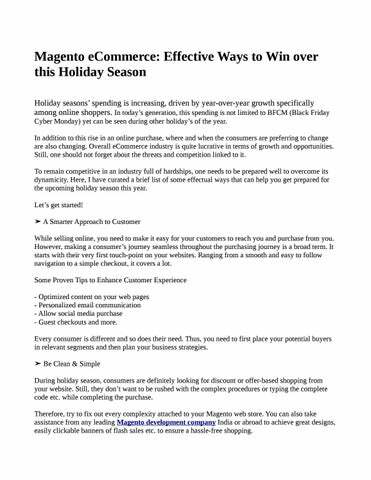 Magento eCommerce: Effective Ways to Win over this Holiday Season Holiday seasons’ spending is increasing, driven by year-over-year growth specifically among online shoppers. In today’s generation, this spending is not limited to BFCM (Black Friday Cyber Monday) yet can be seen during other holiday’s of the year. In addition to this rise in an online purchase, where and when the consumers are preferring to change are also changing. Overall eCommerce industry is quite lucrative in terms of growth and opportunities. Still, one should not forget about the threats and competition linked to it. To remain competitive in an industry full of hardships, one needs to be prepared well to overcome its dynamicity. Here, I have curated a brief list of some effectual ways that can help you get prepared for the upcoming holiday season this year. Let’s get started! ➤ A Smarter Approach to Customer While selling online, you need to make it easy for your customers to reach you and purchase from you. However, making a consumer’s journey seamless throughout the purchasing journey is a broad term. It starts with their very first touch-point on your websites. Ranging from a smooth and easy to follow navigation to a simple checkout, it covers a lot. Some Proven Tips to Enhance Customer Experience - Optimized content on your web pages - Personalized email communication - Allow social media purchase - Guest checkouts and more. Every consumer is different and so does their need. Thus, you need to first place your potential buyers in relevant segments and then plan your business strategies. ➤ Be Clean & Simple During holiday season, consumers are definitely looking for discount or offer-based shopping from your website. Still, they don’t want to be rushed with the complex procedures or typing the complete code etc. while completing the purchase. Therefore, try to fix out every complexity attached to your Magento web store. You can also take assistance from any leading Magento development company India or abroad to achieve great designs, easily clickable banners of flash sales etc. to ensure a hassle-free shopping. ➤ BOPIS Option With the increasing trend of online shopping, physical storefronts are losing their charm. So, this holiday season you can cut down on your eCommerce load, you can offer BOPIS Option to consumers. With over 72% of customers making an additional purchase while picking up BOPIS (Buy Online, Pick Up In-store), it has become a must to try. This sales method allows your customers to place an order on your website and collect it from your nearby retail outlet later. This way you are not only providing them with fast and convenient product possession but also getting additional benefits like a chance to bring offline sales and inventory optimization etc. To simplify such purchase further, you can use GeoIP data that is a great way to promote BOPIS to shoppers nearby your brick-and-mortar retailers. ➤ Work on Product Bundling In general, product bundling refers to combining several individual goods in a single package to increase your sales value while easing out consumers’ purchase. Enhancing product bundling during holiday seasons helps you to increase your sales and revenues. Furthermore, it helps you to better determine the products that are most commonly purchased together. 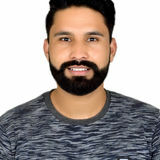 ➤ Expedite Delivery Free shipping is becoming history over the time with the increasing popularity of Fast shipping or delivery. Some retail brands like Nykaa or Lulu and Sky etc. are gaining a competitive edge over others with their same or next day order fulfillment along with a free delivery on a certain amount limit. This way you can also try to boost your business sales while following the same trend and offering expedited delivery. CONCLUSION The Holiday season is all about glitz and glitter everywhere. Let it be a physical storefront or an online website, all you need to do is to be flamboyant and enticing to your potential buyers.